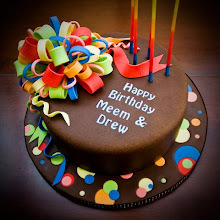 Now for the second cake. This cake I made for my Godson's First Holy Communion. He's a pitcher, a great baseball player and a great kid. So he deserved something cool, not a stuffy communion cake. 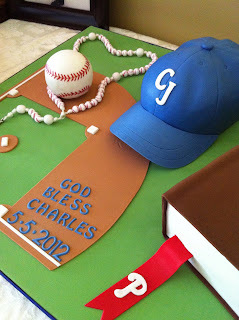 This was such a fun cake to make since I've never done a baseball hat or a book OR a boys cake- I have 3 daughters! 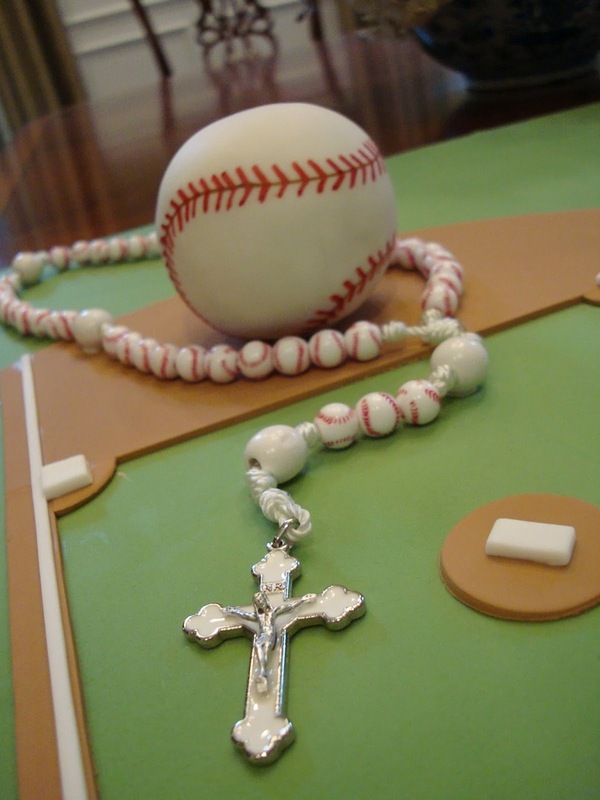 I tried to personalize many of the little aspects, the hat has his initials, the bible is titled for the first communion, the Phillies bookmark, date, etc. 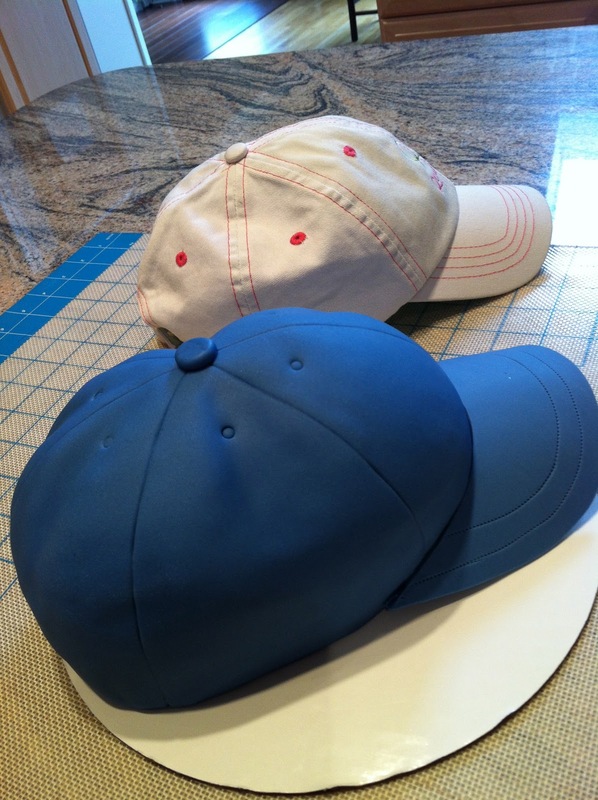 The hat is carved cake covered in fondant, the brim is gumpaste. The bible is a 9x13 cake covered in fondant and the letters are hand painted with gold highlighter dust. The cake board I covered in fondant with all hand cut fondant details and baseball field. The baseball is rice krispy treats covered in fondant then smoothed with sponges for a half hour! Hand painted with edible pens. 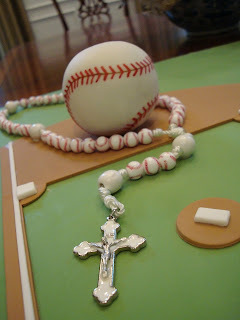 The baseball rosary is real, one of my gifts to Charles. 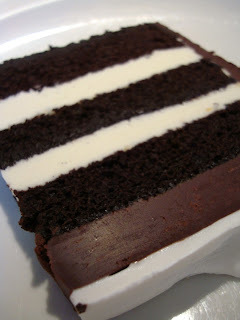 All cake was chocolate chip with vanilla bean swiss meringue buttercream. I know that it's very close to the Holidays, but this is when I like to bake. Here are the goodies I've made for this Christmas. These are Peppermint chip flourless fudge cookies. 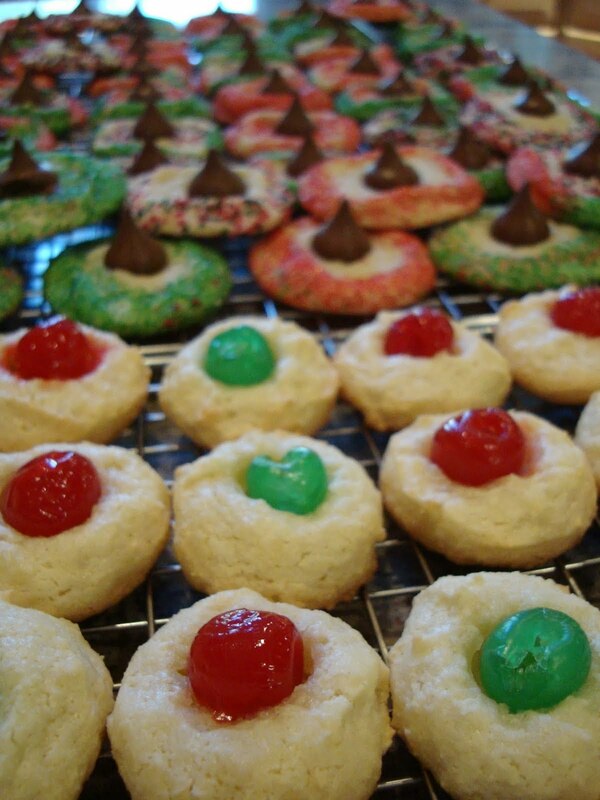 The regular fudge cookie recipe with a cup of peppermint chips added. 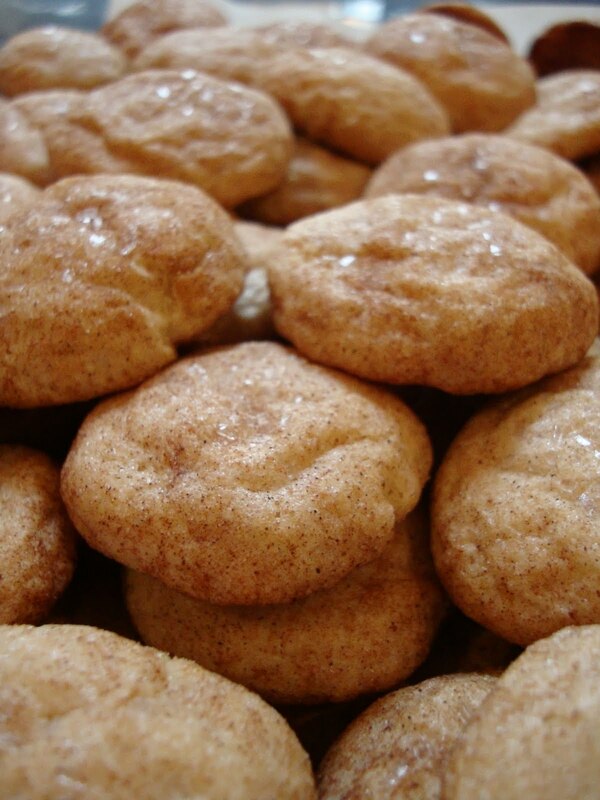 Snickerdoodles, a traditional favorite that has a stronger flavor thanks to Vietnamese Cinnamon and Sparkling sugar on top. These are already gone they were so amazing, Flourless Peanut Butter Chocolate chip cookies. I used milk chocolate chips instead of semi-sweet. 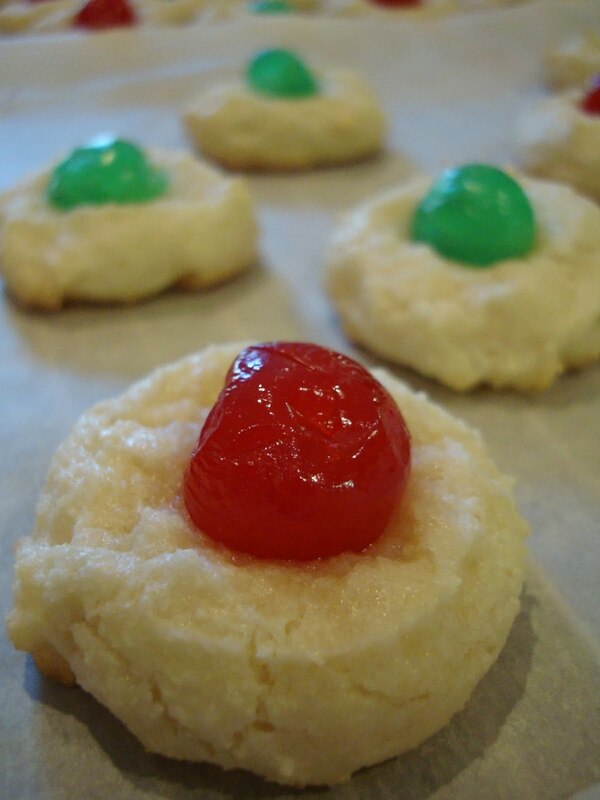 Another hit from King Arthur Flour, Almond Cloud cookies. Because I can't get enough almond, Solo Almond Macaroons. These were very festive. If you love marzipan, you'll love these! And my girls made some fun sugar cookies with Hershey Kisses! Lemon Poppy Seed is a classic cake flavor. We had it as our wedding cake 12 years ago! I recently made a very large batch of individual bite sized glazed lemon poppy seed cakes. I used a fantastic recipe from Southern Living. Because I needed bite sized pieces I baked them in the Wilton square brownie bites silicone pans. But the recipe calls for Mini Bundt pans. They are regular muffin pans but with Bundt shaped cups. These work well when eat person wants their own small cake that's about 3 bites in size. Preheat oven to 350 degrees. Beat butter and cream cheese at med speed till well blended. Gradually add granulated sugar, beating until creamy and fluffy. Add eggs, 1 at a time, beating just until yellow disappears after each addition. Beat in milk, poppy seeds, almond extract and 1 1/2 tsp. lemon zest. Mixture will be slightly lumpy. Whisk together flour and next 2 ingredients in a large bowl. Gradually add to butter mixture, beating until well blended. Spoon batter into 1 greased and floured (12 cup) mini Bundt pan, filling all cups 3/4 full. Spoon remaining batter into second pan filling only 6 cups. Bake at 350 for 24 - 26 minutes until wooden toothpick comes out clean. Remove pans to wire racks and let cakes cool 10 minutes. Whisk together 1 1/4 cups powdered sugar, 1/4 cup lemon juice and remaining 1/2 tsp lemon zest until smooth. 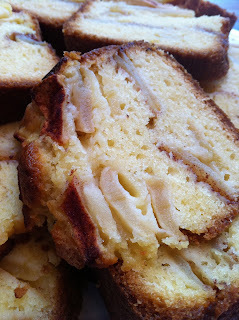 Drizzle glaze over warm cakes. Let cakes stand 4 to 5 minutes or until glaze is set. * I dipped the cakes into the glaze after they were cooled. And then after the glaze was set I dipped them a second time. It was my experience that the glaze takes longer to set than a few minutes, but I made my glaze thinner to allow for dipping. Obviously if you use the small squares pan the cooking time is greatly reduced. I love chestnuts. And this is the time of the year to get them! I don't roast them over an open fire but they still taste wonderful. Very easy to do, but it does take a little time and patience to shell them. They are best when still warm but keep in an airtight container for several days. This is the recipe I used. I chose the 'In the Oven' method because I have a cast iron skillet. It has always worked perfectly. There are always a few that don't turn out. If when shelling them it doesn't peel off easily then discard that chestnut.